Arsenal have now won ten straight matches. That is impressive. The eight wins before the Fulham match and now this one against Leicester City were not always pretty but the team got the results that they needed. Now Arsenal have put together two impressive performances in a row and have re-entered the top four of the table. This was the kind of performance that shows just how good Mesut Özil can be, and just how special a player he is. I just gave you a ton of the stats for what he did in the match and they are impressive, but if you watched that match and came away thinking anything but that he was incredible… well I don’t think that there is anything that can be done to convince you otherwise. I hope that this is the start of Özil finding his role in the Emery system and that he can start reaching this level more regularly for Arsenal. When he plays like this Arsenal are joy to watch and can match any team in the league. Alex Iwobi didn’t fill up the stat sheet quite like Özil did but he has really impressed me so far this season and today was a continuation of that trend. In a squad that doesn’t have star wide players who have established themselves in the wide areas, Iwobi has done everything to make the position his own. Defenders need to keep their legs closed near Iwobi. Arsenal have been a slow starting team this season, playing poorly from the opening whistle. They then usually come out from half time and show a marked improvement in how they perform. The only real exception to this was the match away to Chelsea; but that still saw Arsenal fall behind quickly in the opening 20 minutes before they turned around the performance. Below is a chart of the shots, goals and xG split out between the first and second halves this season. 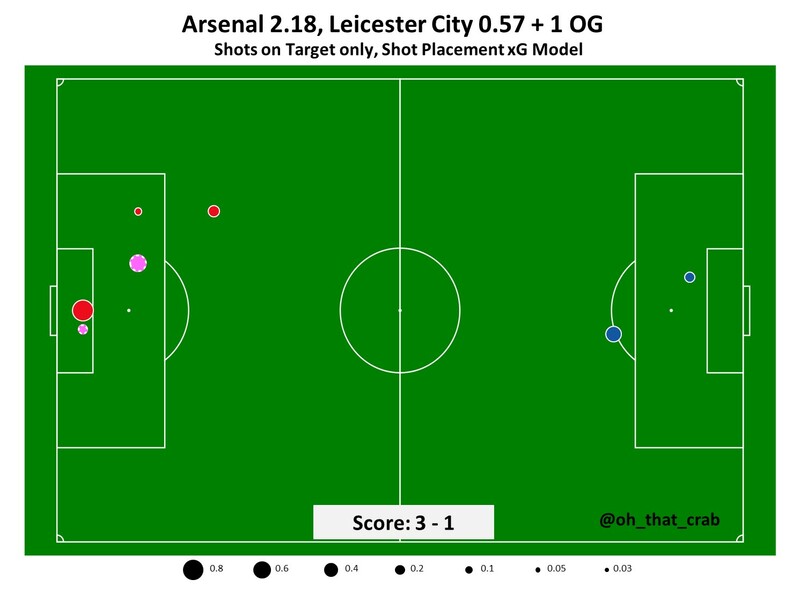 The match against Leicester played out the same way as so many of Arsenal’s other matches. The first half was very even stats wise, on shots (10 to 9), touches in the box (9 to 13), goals (1 to 1) and xG (0.8 to 0.6) both teams did about the same. Overall watching it looked like Leicester were the better team for about 30 minutes and then Arsenal woke up and started playing. In the second half that flipped, especially until the last few minutes when the game was no longer in doubt. 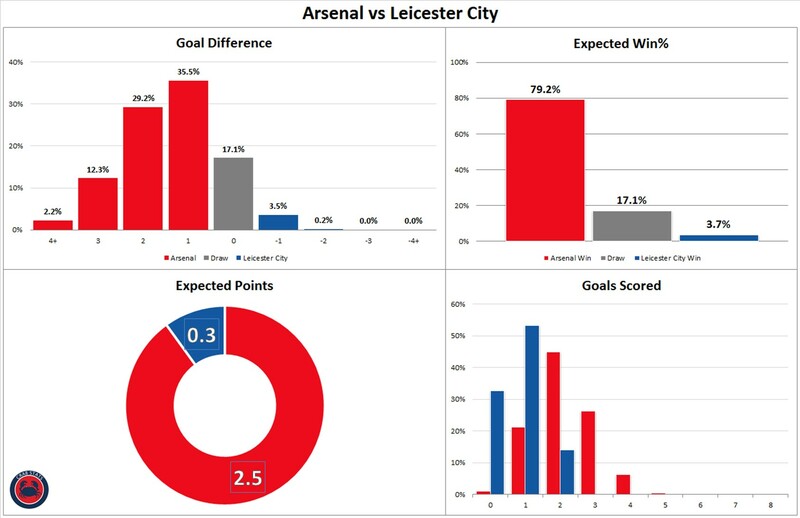 I don’t know if there is some sort of plan to keep things tight for the first 45 minutes before unleashing the attack in the second half or that Arsenal are betting on their improved fitness to see them past a tired opponent but in this match and in general that has been Arsenal’s calling card. I can’t believe the Bayern press conference disaster and Mesut’s masterclass happened in the same week. It’s too rich – you couldn’t make this sh*t up. F*ck Uli Hoeness and f*ck Bayern. There’s only one Mesut Özil! I’m happy that pass to find bellerin for the second goal is rated same as a goal from the center. I just can’t stop wondering so much wisdom, intelligence, skill, knowledge and experience in one pass. I love you Arsenal Fc I’ve never been been ashamed to be your fan. Once again, some terrific insights here – the stats and analytics on Ozil’s performance are especially good, in that they lend quantiative context to what we saw. One thing I have been wondering: in the ‘running XG’ chart, is there a reason why the XG ‘moments’ (i.e. 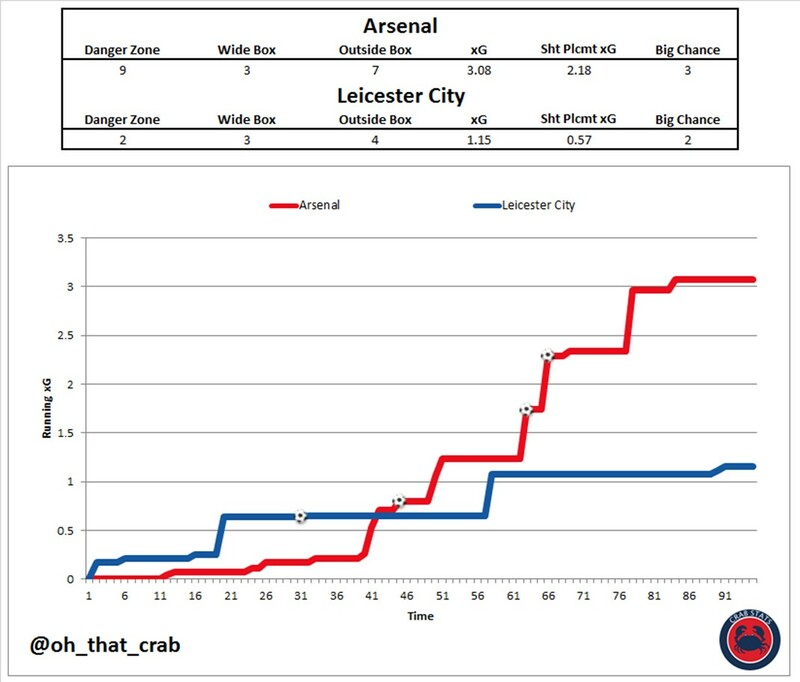 when the XG chart goes up by a unit, representing a big chance) have a gradient, as opposed to being an instant increase? It kind of looks as though the chance built up over a minute or so – is that correct? In the build-up to Ozil’s goal, for example, the gradient is less steep that for the other two goals – is that indicative of a big chance being created through a cumulative effort? I would be interested in seeing this unpacked a bit. So this shows when the shots actually happened, I also use 1 minute increments because other wise it would get a bit unwieldy and not provide much more clarification for that trade off. What I posted here is the running offense value added which has more of that information on the buildup that you are looking for. Mesut is a special player. He is not the fastest, the strongest nor does he play with a high level of intensity, but what he does have is an unerring calmness on the pitch. He has confidence in his ability on the pitch and doesn’t seem to question his ability to pull off the sublime. I have to say though that his biggest weakness is also his greatest strength, which is his unselfishness. Mesut has put creating chances for teammates above taking those chances himself, and that in a football climate that typically favours the selfish, he will always be questioned. Mesut is at the ercy of his teammates, wel he now has the strikers to match his quality chances with quality finishes and give him the assist stats that he sorely deserves. I am not looking for Mesut to replicate this performance over and over again, I am looking forward to Aubameyang and Laca getting into positions to score, and putting the finishing touches in big games to Ozil’s creativity. More credit should go to the midfield for their second half performance and getting a hold of the game. It is overlooked for the numbers Ozil put up, but just getting on the front foot and never looking like Leicester will be given a look in, was to me the best part of the game. Couldn’t agree more. That pass to Bellerin was the very definition of “pre-assist” and thankfully it was converted. But man, to think of how many pre-assists have gone to waste in the past.. The American post-match analysis included Kyle Martino (former US national team player) praising Torreira’s importance in creating a solid base for the attack ahead of him. He said that watching on the tactical camera, you could see Torreira constantly anticipating danger and shifting to cover every possible defensive gap. I think it is much easier for supporters at the match, rather than those of us who watched on television, to appreciate what Torreira does. Thanks guys for the stats and the insights. I totally agree for Lucas. He is the glue that keeps the team balanced. I dare to say that he is a 50:50 mix of Coq and Cazorla. The kind of player that makes the whole team play better. 21point from 7 games, 21/21, #Project24 is on track! Crystal Palace next, then the Liverpool acid test…. That will be the big test, I am happy to see Arsenal starting to click a bit more as a team. It has sucked that it has taken Aubameyang and Ramsey dropping to the bench to make it happen but I think that was needed to get the proper balance in the team. I wish that there was a way to get the full tactical camera after the match to be able to watch. Like the have for NFL where they publish the “All 22” film. The “All 22” camera angle would be great. With the existing heat map and player tracking technology it is hard to envision the movement of all the players simultaneously. 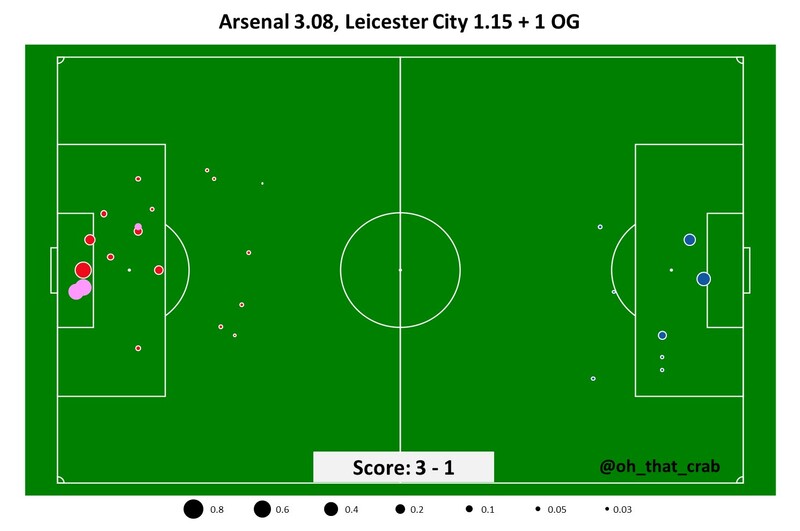 Would be very interesting to see the player movements off the ball, for example the way Vardy and Iheanacho positioned themselves to targeted the outside channels when Leicester did not have possession. Another beauty was Auba’s movement for the second goal, he is already sprinting towards goal even before Ozil makes his defence splitting pass to Bellerin. The “All 22” angle will be very insightful. The Nigerian Nutmeg Prince. He has so much sauce and now he is putting up performances to match too. He has been so fun this season. Ozil was sublime! More of that please. Where are the player ratings?